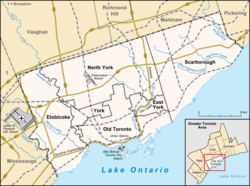 Rexdale is a district of Toronto, Ontario, Canada, located north-west of the central core, in the former suburb of Etobicoke. Rexdale defines an area of several official neighbourhoods north of Highway 401 and east of Highway 427. Rexdale was originally a post World War II residential development within Etobicoke, and today is applied to a general area from Malton and Toronto Pearson International Airport in the City of Mississauga to the west, Highway 401 to the south, Steeles Avenue to the north, and the Humber River to the east. It is centred on Rexdale Boulevard and Islington Avenue. The Woodbine Racetrack is situated in Rexdale. 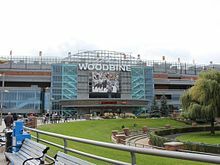 The area is home to several major institutions and attractions, including the Canadian Standards Association, Woodbine Centre shopping mall, and Woodbine Racetrack. Rexdale was named for local real estate developer Rex Heslop, who purchased farmland in the area in 1955 for a cost of $110,000, and installed water mains, streets and sewers, as well as houses that listed for sale at either $9,000 or $10,000. The homes sold well, and soon 330 families were living in the development. In 1956, Heslop opened the Rexdale Plaza (since demolished and replaced by a power centre). By then, 70 industries and 3,600 homes were located in Rexdale. Rexdale's first residents were mostly English and Scottish, but it evolved into a multicultural neighbourhood in the following decades led by those from the Caribbean and the Indian Subcontinent. The population of Rexdale, according to the 2006 Census, is 94,469 living in 30,238 households. The population grows at a rate comparable to surrounding communities. In 2006, Christopher Hume, a journalist with the Toronto Star, wrote that Rexdale "has become shorthand for suburban blight, social breakdown and gang violence. In 2005 alone, five young men were shot dead in the area, a grey landscape of highways and highrises, shopping malls and churches." Hume wrote that children who lived in Rexdale had nothing to do, and were "wandering around the anonymous streets of this place". The vision of Rexdale's planners, Hume wrote, was a patchwork of separate precincts for working, living, shopping and playing, connected by expressways. However, this single-use zoning, separation, industrial-scale development and reliance on cars contributed to Rexdale's problems. Joyce Lau of the South China Morning Post stated in 2015 that in Rexdale "other immigrants live in poverty, surrounded by crime." West Humber Collegiate Institute is one of several public secondary schools in the area. Marian Academy, now closed, was located in Rexdale, within an area that, in 2001, was the poorest area of Rexdale. The North Campus of Humber College is located within Rexdale. The same campus also hosts the University of Guelph-Humber, a post-secondary institution operated by Humber College, and the University of Guelph. The Rexdale branch of the Toronto Public Library is located in the area. In 2006, Rexdale was the setting of the TV movie Doomstown. The youth TV series How to Be Indie took place in Rexdale. NAV also mentioned it in his song Myself. ^ "Rexdale". Geographical Names Data Base. Natural Resources Canada. Retrieved 2017-05-29. ^ Filey, Mike (2006). Toronto Sketches 9: "The Way We Were" Columns from the Toronto Sunday Sun. Dundurn. pp. 103–105. ^ Hume, Christopher (February 18, 2006). "At The Least, Build a Community Centre". Urbantoronto.ca. ^ Lau, Joyce (2016-11-09). "A murder in Toronto and the dark side of the Asian immigrant dream". South China Morning Post. Retrieved 2018-09-18. ^ Royson, James. "Closing school dagger to heart of Rexdale." Toronto Star. December 12, 2001. News p. B01. Retrieved on August 27, 2013. Wikimedia Commons has media related to Rexdale.